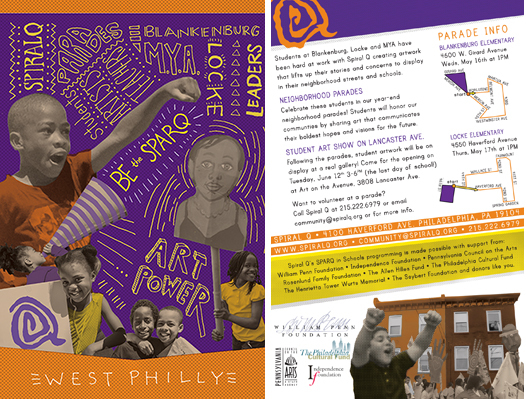 Spiral Q’s school and community partnerships in West Philadelphia bridge sequential arts education with project based learning to support students, classroom teachers, principals and families in advancing student learning and cultivating community. 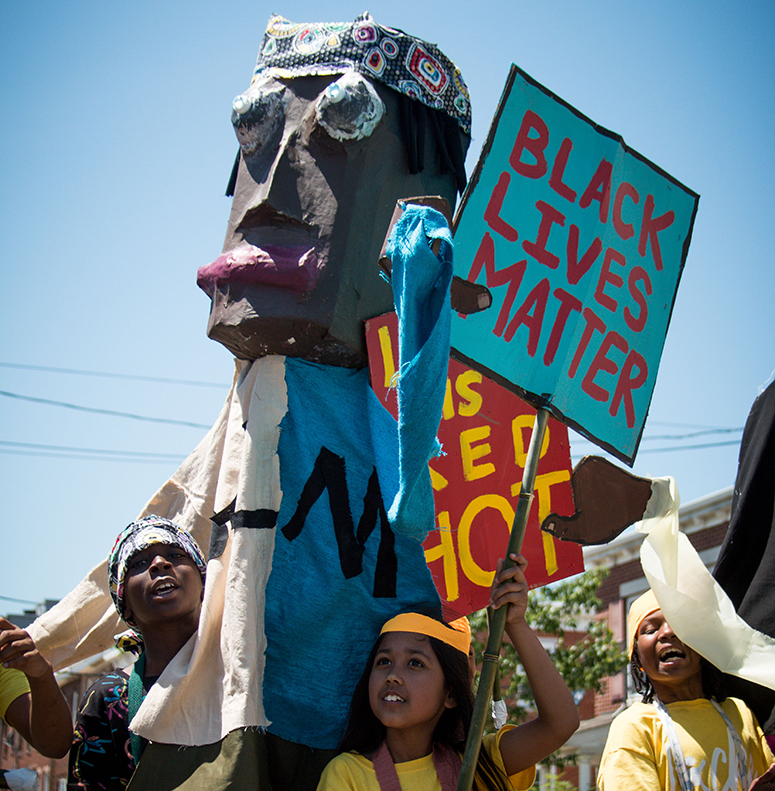 Students collaborate to produce art for a neighborhood parade that reflects their collective stories and aspirations, celebrates their cultures and families, and inspires the school community at large. At Spiral Q, we believe that student success depends on a collective and supported effort on the part of parents, teachers, artists, and administrators that combines the unique strengths of each. Ultimately, the projects support the development of deep listening, school pride and, the cultivation of a spirit of joy and cooperation, help to build excitement among students about learning and advocating for issues that they care about and supports teachers objectives in the classrooms. Teachers, administrators, parents, and Spiral Q staff and artists work together to plan projects that support: 1) teachers’ goals in the classroom, 2) principal’s objectives for the school, 3) parents’ dreams for their children 4) Spiral Q’s mission Planning for teachers includes pre-project meetings, easy regular check- ins, and a final debriefing and assessment. Parade planning is a collaborative team effort lead by Spiral Q. The whole project includes light touch activities for the larger student population to get involved in the culminating parade and celebration, including pep rally assemblies and more! One of Spiral Q’s greatest strengths is our ability to work with partners toward their needs. We have programs to connect, engage, and inspire students, staff and administrators toward their goals and visions. We seek to use these elements to reach school’s goals and objectives. Spiral Q’s arts residencies bring multi-disciplinary projects to schools that strengthen student’s abilities to collaborate, innovate, and express themselves. 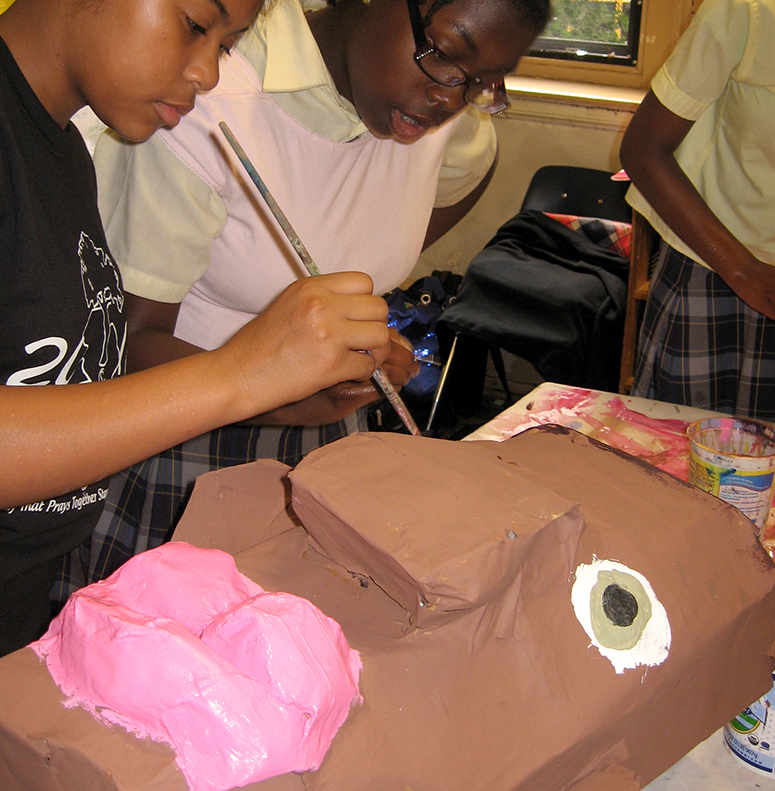 Emphasizing the use of recycled, reused and readily accessible materials in our art making processes, we connect students to themes like literacy and civic responsibility coupled with overarching values of sustainability and environmentalism. Spiral Q residencies reveal that our students as individuals, artists and makers hold the power to transform and elevate the forgotten and discarded into something beautiful and special. Assemblies at the beginning and the end of the year’s program tap into what is on students’ minds, get them excited and prepared for their Spiral Q project and parade, and connect the work they are doing to the long history of communities coming together in celebration and protest in the streets across culture and time. 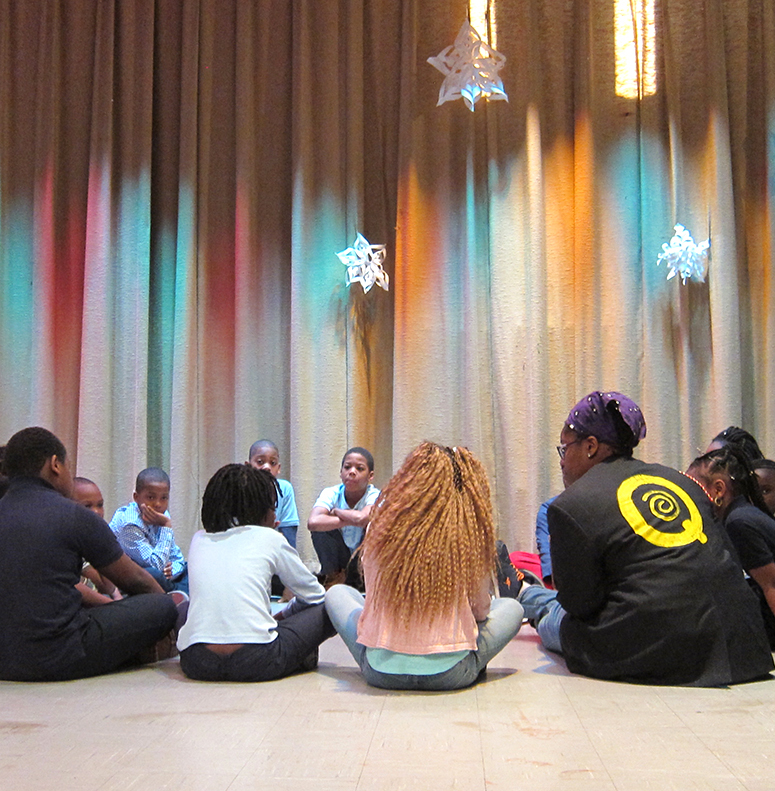 The Story Circle process fosters socio-emotional development by holding equal space for students & teachers to self-direct positive listening and sharing experiences to expand a greater understanding of one another’s experiences through facilitated sharing, reflecting and gathering of one another’s stories. A story prompt will provide direction based on a problem or opportunity identified by the school leadership. Parades give students the opportunity to proudly share their creativity and concerns publicly, and also provides a venue for community members to be present for the students’ efforts. 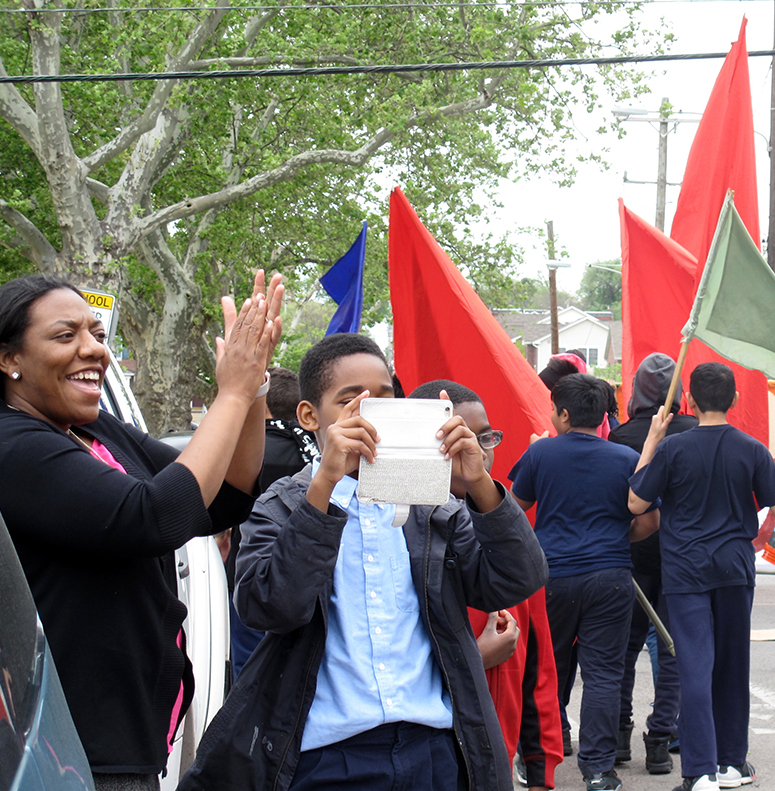 Parades can unify schools and connect beyond the boundaries of school walls. Spiral Q parade art residencies, can similarly connect the work of existing in-school arts programs to meaningful participatory performance and presentation. All parades are designed to welcome and engage the entire school population, determined by each school’s administration. Spiral Q can bring a giant scrolling puppet show and performance to your school! 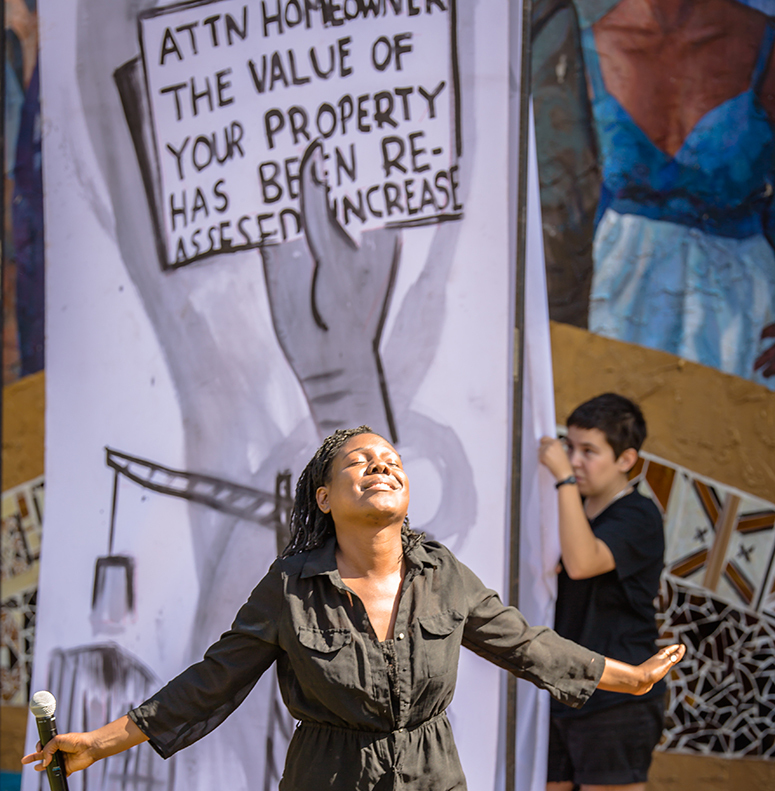 Performed by actress Lena Lewis, We Remain: Our Light, Our Legacy tells stories about growing up in surrounding neighborhoods of West Philadelphia. 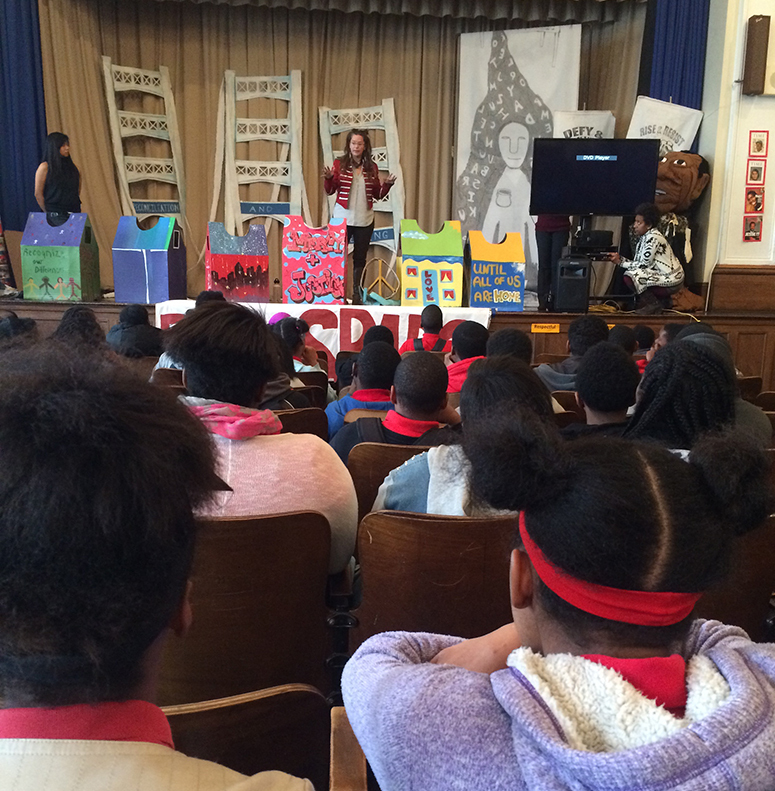 Students will experience another medium for lifting up neighborhood pride and stories through art. Two hour experiential training of Spiral Q programs and pedagogy for all school staff integrated into their existing Professional Development schedules. This has been an option for previous and current school partners. Spiral Q has seen this work shift culture around staff-to-staff communications and teacher-to-student perspectives as well as to give the school a better understanding and awareness of the Spiral Q program throughout the year. Spiral Q’s SPARQ in Schools programming is made possible with support from: William Penn Foundation • Independence Foundation • Pennsylvania Council on the Arts Rosenlund Family Foundation • The Allen Hilles Fund • The Philadelphia Cultural Fund • The Henrietta Tower Wurts Memorial • The Seybert Foundation and donors like you.